Ireland. If you are one of the more than 40 million Americans of Irish descent – or even if you are not – 2013 is a particularly good time to book a visit to the Emerald Isle. That’s because Ireland is hosting a yearlong celebration called The Gathering Ireland, which features a wealth of festivals, cultural events, sporting events, clan gatherings and more. 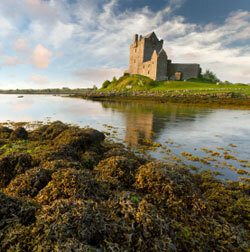 And of course, that is on top of all the things that draw more than 6 million visitors to Ireland every year. San Francisco. The City by the Bay is hosting a variety of America’s Cup events along its famous waterfront, which also boasts a newly relocated hands-on science museum, the Exploratorium. Amsterdam. Amsterdam is celebrating 400 years of its famous canals by doing what it does best: throwing a party. And while you’re at it, you can celebrate the 160th anniversary of the birth of Vincent van Gogh. Florida. Ponce de Leon landed in Florida 500 years ago, and the Sunshine State is pulling out all the stops to celebrate. There are a variety of events already scheduled, and more will certainly follow. Check out the website fla500.com for more information. Hangzhou, China. This beautiful city is already a UNESCO World Heritage Site and a popular destination for travelers. But starting in 2013, new high-speed rail service to and from Shanghai and other cities makes it even easier to visit. Nashville, Tenn. One of the new draws in the capital of country music is the Music City Center, a concert venue and public space celebrating the arts that opens in 2013. Also opening this year is the Johnny Cash Museum, and the Musician’s Hall of Fame and Museum is reopening in a new venue. Croatia. Croatia joins the European Union in July, which will make it easier for travelers coming from other EU countries. In addition, the EU will provide funds to help Croatia further enhance its tourism industry. Turkey. Turkey has long been a destination for travelers looking for a chance to experience both Europe and Asia. But getting there and staying are easier than ever. Turkey has grown its tourism infrastructure by 67 percent in the last 10 years, and this year will see the opening of several new hotels and the expansion of air service. Zambia 2013 is the 200th anniversary of the birth of explorer David Livingstone, and the city that bears his name – and is a popular gateway to the breathtaking Victoria Falls -- is planning months of events to celebrate.